Aminu Tambuwal, Sokoto governor, is reportedly not on the list of the Independent National Electoral Commission (INEC) for the 2019 governorship election. According to Daily Trust, the governor’s name is missing from the names of candidates for elections in Sokoto. Manir Dan’iya was reportedly listed as the governorship candidate of the Peoples Democratic Party (PDP). 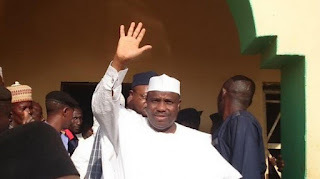 Tambuwal had contested the PDP presidential primary alongside former Vice-President Atiku Abubakar, Senate President Bukola Saraki, among others. The governor, who recently dumped the All Progressives Congress (APC) for the PDP, came third in the exercise behind Saraki and eventual winner Atiku. In a related development, the governorship candidates of the APC in Imo and Zamfara were on Saturday not reflected in the list of parties for the 2019 governorship election. However, the INEC later published the name of senator Hope Uzodinma as the candidate of the APC in Imo. Channels reports that the electoral body made the disclosure following a court order obtained by the APC candidate from a high court of the federal capital territory (FCT) in Abuja. Some aspirants had earlier obtained a court order from the federal high court sitting in Owerri, restraining INEC from publishing the name of the party’s candidate. But Hope had approached the FCT court for an order to override the ruling.